• whether and to what extent safeguard measures are subject to judicial review. 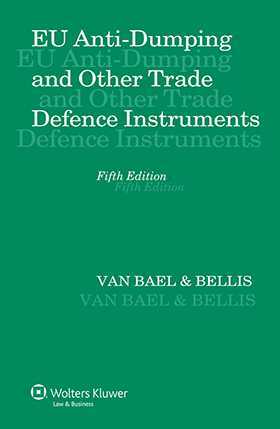 For each of the four major categories of trade defence instruments, chapters deal with the substantive rules of the trade defence instruments concerned, the relief that may be ordered under these instruments, and the procedural provisions. The important changes in the EU decision-making process for trade defence cases to be introduced in March 2011 are taken fully into account. An extensive battery of tables and annexes leads the practitioner to all the essential primary source material in the field. As a detailed and practical commentary on the international trade legislation of the Union as actually applied by the Union Institutions, this is the preeminent work in the field. Chapter 1. Introduction: The EU Trade Defence Laws in Perspective..
Chapter 3. Substantive Elements I: Dumping. Chapter 4. Substantive Elements II: Injury. Chapter 5. Substantive Elements III: Union Interest. Part II: Subsidies and Countervailing Measures. Part IV: The Trade Barriers Regulation.